It was just another day in September of the year that I was to turn 13 years old. I had been seated, doing a chore in the kitchen, and as I stood up, lo and behold, the seat of the skirt I wore was stained with dark red blood. My Mom hurried me off to the toilet, and handed me a sanitary pad; she actually placed it in my underwear, because I could not understand what was really happening. All I knew was, beneath her stoic expression was excitement. My sisters were just outside the door, looking for some news of what had happened to me, an answer to why Mom and I were closeted in the toilet. When I was set up fine, my mom gave me the ‘now-you-are-a-woman’ talk, in addition to the standard ‘don’t-let-any-man-touch-you-or-else-you-will-get-pregnant one, just for emphasis. I was sufficiently scared by then, and the fact that I did not fully understand what was happening to me just made it all blurry. It just made me more withdrawn. I was not in pain, but I was very moody. I was conscious of the fact that there was something in between my legs. Well, that day, I became a “woman”, because one major thing that would define, whether I would be able to perform one of my ‘womanly’ functions (have kids) started. And since then, the visits of Aunt Flo have become one of the high points of my month (tongue in cheek, of course). There were months I looked forward to its arrival; worry and calendar watch characterised those months it was late, and I knew I was nowhere near the safe zone, when we did the deed. Let’s not talk about the pain, or those days of heavy bleeding, or the times my period lasted for more than a week. We can definitely skip talking about PMS, the sugar craving, and the mood swings. Aunt Flo is such a blessing! Even now, when everything seems almost predictable, and the fact that if I forget my date or the app on my phone forgets to prompt me, I can just call either one of my two sisters, or my mom, to get their date, as our periods are in sync! Genes or coincidence? I don’t know, but it’s helpful during those months I’m not paying attention to my body, and its Aunt Flo’s actual presence that makes me realise she is here. At those times, I pay dearly for it. While my cycle is pretty predictable, not every woman is like that. Some women have heavy and short periods, some light and long, and some women have periods that skip for four straight years. In all of these, there is a message in this important bodily function, as it has a lot to do with our fertility. There are some signs, which we might have taken for granted but they deserve a closer look. Here are a few hints, which your period might be telling you and what you can do about it. This could be a sign of Polycystic Ovary Syndrome (PCOS), low body fat, thyroid dysfunction, stress, all of which factors could impair one’s fertility. The most common reasons you should miss your periods are pregnancy, and if you are menopausal. But if you are too young to have gone into menopause, and can’t possibly be pregnant, having missed periods could be a pointer that you have problems with your thyroid, or have a hormonal imbalance that causes cysts to grow on your ovaries (PCOS), or are just way too stressed. Another possible cause of your period not showing up is your weight, either when you are overweight or underweight, it could affect your fertility. Being underweight for one BMI can mean, having no period; athletes and women who are fitness buffs are prone to having low fat, which could harm their chances of conception. I will admit that most of my memories of menstruation have been mostly painful. And that is because I have experienced more times when Aunt Flo came with pain, than not. According to doctors, having a painful period could be a sign of endometriosis, fibroids, vaginal scarring, adhesions, etc. The reason periods are painful is that every month, your uterine muscles contract and release to push blood out, and those contractions mean almost everyone will feel some amount of pain. However, it should cause some concern if the pain of the period cannot be relieved with common pain medication, and the pain is interfering with your daily life, like going to work or socialising. One of the conditions that an extra painful period could signify is endometriosis, a silent hormonal disorder, affecting more women than are diagnosed. This condition causes the tissues that should only grow in the womb to grow outside it and during each menstrual period, they would also bleed, only there is no outlet, thus the tissues build up, leading to pelvic pain. It’s a painful condition that only its sufferer will fully understand its effects. Although there is no cure for endometriosis, there are ways its pain can be assuaged. Other issues that can cause painful menstruation are fibroids, and scar tissue from previous surgeries, or structural abnormalities in your uterus. When should painful periods be of concern? When it’s been on for 3 months, standard pain medication isn’t working, and normal daily activities are affected. Then it’s time to talk to your doctor. Obviously, when you use two to three packs of super sanitary pack in 4 to 5 days of period, then something is so not well. 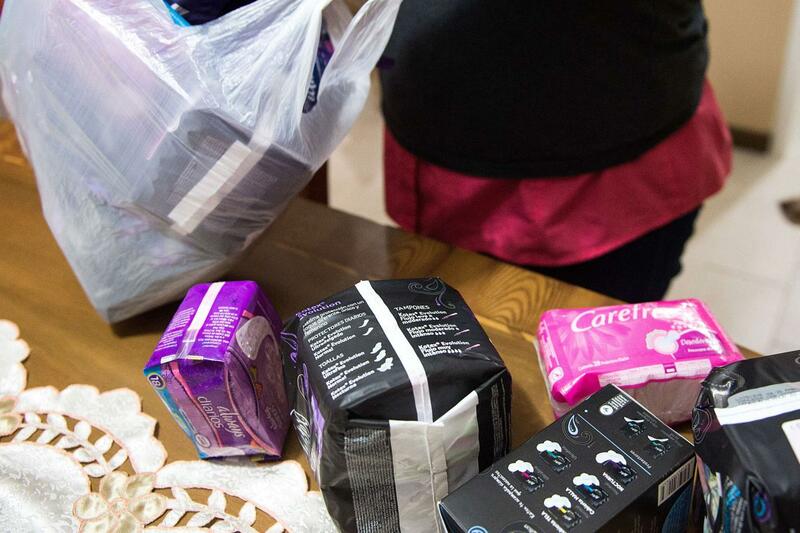 I was never close to this state, but I have a close friend, whose investment in sanitary pads is quite alarming. She has resorted to buying in bulk, as her cycle has become all out of sorts nowadays. When your period feels like someone turned on a tap and forgot to turn it off, it could be signs of Fibroids, hemophilia, hormone imbalance and blood thinners. More so, if you constantly worry about getting stained, then it’s considered “extremely heavy,” and that is according to this reproductive endocrinologist, who should know, Dr. Aaron K. Styer. “If every period causes you this stress, it could mean you have either too much, or too little, of one of the hormones that regulate menstruation; estrogen and progesterone. Or you have fibroids (yes, those keep coming up). Another thing that could cause heavy flow is the side effect of non-hormonal birth control methods like intrauterine devices (IUDs). They can also be a sign of uterine cancer, though that’s rare. Styer recommends you see a doctor, once you are changing multiple pads or tampons every hour, regularly bleeding through your clothes, your everyday life is affected, while on your period, or you are getting dizzy, weak, or constantly out of breath. This is different from having no period. In this case, your period comes but it is irregular. Aunt Flo coming every 28 days to the start of your next period is not normal for everyone. All you need is some calculation to find out the number of days in your own cycle (you can find a calculation on our website). While, it’s normal for women to have as few as nine periods a year, anything fewer than that could indicate you need to see a doctor. Dr. Styer noted that not all sudden changes in your menstrual cycle are cause for concern, as even women whose periods come like clockwork will likely miss a month or two at some point, and a woman’s period changes as she ages, so a “normal” period for you could be something completely different at 40, than it was at 30. Hormone imbalances and fibroids again top the list of reasons periods can be few and far between, but polyps (non-cancerous growths on the inner wall of your uterus) also get some of the blame. To treat polyps, your doctor might prescribe medication that regulates your hormones and reduce the symptoms, or might remove them through minimally invasive surgery. These are some things your period, by its presence or otherwise, is trying to tell you about your fertility. While some people have never paid much attention to their period, because they have never had any reason to, however, to the 1 in 6 moms out there battling infertility, the period is a big deal. It signals the start of a fresh cycle and new hopes. Fingers crossed for the very best for our TTC moms this year; that Aunt Flo will not just be reminders that another cycle had been lost. Please I have the same problem I miss my periods sometimes two months or one month before my next period and my doctor asked me to go take a scan she later told me there was nothing wrong with me after looking at the scan results. Am I safe? Hi Christiana, you need to ask your doctor what she saw in the scan that made her conclude you were fine, even though your period is not regular. I think it will be nice if you get a second opinion. Sylvia, your doctor is right about not worrying over the ovarian cysts, in that some cysts sort themselves out over time, but I’m concerned that the case of irregular period has been going on for years. It might be a good idea to see another doctor, and run some tests. It is not normal that your period is not regular. Godspeed Sylvia. Kikelomo, you can type in the first day of your cycle, (that is the day, your period starts) and the average length of your cycle, (for most women, it is 28 days) into our cycle calculator. If you are using your phone, you will find it at the end of the page, if you are on laptop or desktop, you will find it on the right hand aside of the website. And am only 19 almost in my twenties. Hi Redeeemer, painful cramps are not a normal part of a period and more so as yours comes late sometimes too. Your health is your wealth, please try and see a doctor, so you can run some tests and then, you can take it from there. Hi Nana, you need to see your doctor soon, to find the cause of this. It could be anything from endo to fibroid or it could be normal but you need to see your doctor to be able to pinpoint what’s going on and treat appropriately. Hi Nana Ama, if yours is an average length of 28 days cycle or less, it is possible to see your period twice in a month and it is still normal. However, is your flow usually heavy or light? Depending on your answer, you might want to see a doctor to find out what’s going on. I will like to know if the change of environment and also the choice of food intake also helps in reducing menstrual cramps? my period length alternates. sometimes 26 some 29 but it has never exceeded 31 except for when i went to nysc camp and wjen amnon medication. and it is always 4 or 5 days. can my period be said to be irregular or regular. Hi Adeola. I wouldn’t say it’s irregular. Not all women are clockwork 28 or 29 days. Sometimes, there are factors that contribute to the delay…like diet changes and stress. Have you had any accompanying weight gain? Or any other notable physical changes? Your Comment…hi am a Debby I have been on TTC for almost a year now after a miscarriage though I get my period every month but my dates keep changing could something be wrong? Hi Deborah. So sorry about the miscarriage. How varied have the dates been? 2 days, 3, 4, more?